1. What has been Auburn’s # 1 Struggle All Year? 2. What has Auburn failed to do most of the Year offensively? 3. What has been Auburn’s biggest offensive weapon this year? How Did Auburn beat Alabama last night? By reversing all those trends. A solid combination of pitching, small ball, and not having to rely on home runs for points. It was surprising to say the least. Jon Luke Jacobs pitched a gem. Joseph Sanders finally returned. Auburn never quit. 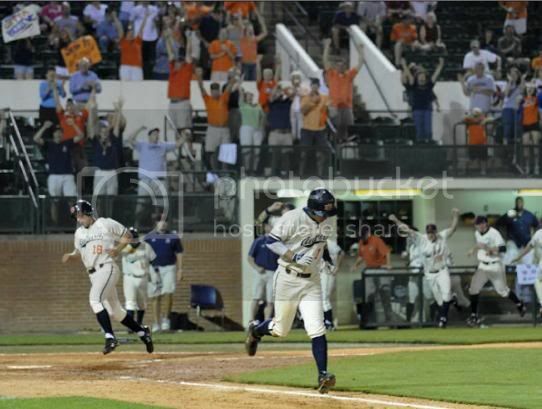 Battling back to score the tieing run in the bottom of the ninth and showing (gasp) patience with the bases loaded to take a walk in the bottom of the 10th and beat Alabama to open the final series of the year. Nothing can be written here that would do these guys justice. Jon Luke Jacobs and Austin Hubbard. Wow. Early on in the game, Auburn struggled with runners in scoring position. Leaving men stranded on Second Base in the 1st and 3rd. But when it mattered most. In the Seventh Inning, Ninth, and Tenth. Auburn capitalized. All without a HR. All without an extra base hit. The biggest thing? Auburn never quit. "The kids just kept battling back," Auburn Head Coach John Pawlowski said. "Both pitchers went out there and were dominating. We couldn't get much going, but fortunately for us we battled back." I wish I could find the picture, but it summed it up perfectly. The change in attitude. In the 9th. Down a run. Down the their final out. Tony Caldwell came up big. Ripping a all through the gap. On TV you could see the shot from the Auburn dugout. All the player with RALLY CAPS on. That’s right. RALLY CAPS. These guys were having fun last night. They were a team and Auburn is a different team under CJP. Four Jobus. Four out of Four. Yes, I know Jobus is normally out of five. However, we have to have new expectations to end the season.